The swing 'n go portable swing provides plush luxury with portable convenience! Neutral pastel colors and ultra-plush padding and fabrics make this baby swing the ideal soothing companion for baby boys or girls. 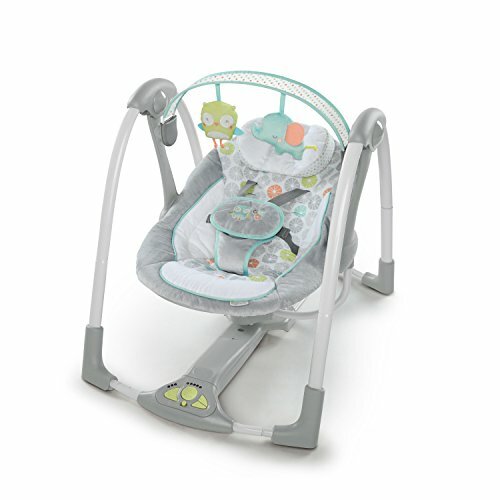 Five swing speeds and three timer choices allow parents to find the perfect swing-time comfort zone for their little one. As infants swing, they are able to relax to eight melodies and three pleasing nature sounds. Innovative Hyberdrive technology saves on batteries so baby enjoys longer swing times. The portable swing includes easy-to-clean fabrics and folds flat for easy transport and storage. Five-Point harness, sturdy construction, padded head support, and non-slip feet provide the safety features parents demand. Care & Maintenance:Wash fabrics with cold water, gentle cycle. No bleach. Seat pad can be placed in dryer on low heat; air dry headrest flat. Wipe toys and frame clean.